Displays at the War Remnants Museum. Vice-president's reception room in the Reunification Palace. Outdoor displays at the War Remnants Museum. Stalls at Ben Thanh Market. Interior of Jade Emperor Pagoda. HCMC (Ho Chi Minh City) Museum. Ho Chi Minh City's Notre Dame Cathedral. Fighter planes outside Ho Chi Minh City's War Remnants Museum. The President's National Reception Room at the Reunification Palace. Circular red carpet inside the Reunification Palace. An American helicopter at the War Remnants Museum. Exterior of Ben Thanh Market. A room in the Reunification Palace. Khanh Van Nam Vien Pagoda. Altar and offering box inside Jade Emperor Pagoda. Sculpture at Mariamman Hindu Temple. Ben Thanh Market in Ho Chi Minh City. Reception hall alter at the Giac Vien Pagoda. Produce stand at Ben Thanh Market. 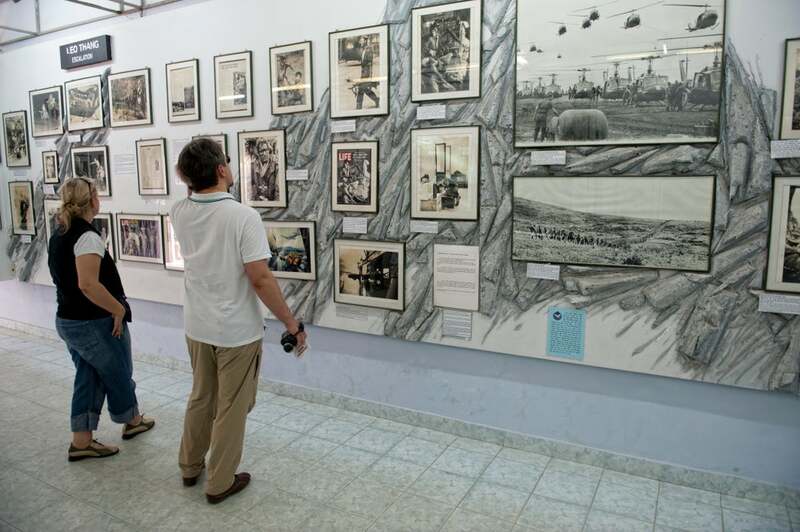 Photos displayed at the War Remnants Museum. Reunification Palace in Ho Chi Minh City. Coffee for sale at Ben Thanh Market. Stupa at Giac Lam Pagoda.